With so much loss and sadness as of late, let me add a little levity to our day, now that I can laugh about it. With Valentine’s Day right around the corner, I can’t help but reflect on a happening some years ago, when I was in my late twenties. I probably perceived some rather frivolous things more seriously than I should. I was working 12 to 16 hour days, six days a week in a building where the majority of the employees were male (probably 99 percent). I only knew of one other woman in the building. She was a married dispatcher in the police station downstairs. Even though the odds of dating were in my favor, it wasn’t happening. I worked way too many hours and really had no time for a social life. I was on great terms with everyone I worked with, so coming to work was quite enjoyable and laughter was an integral part of the office relationships even though every day was arduous for all and felt like each overlapped the next. Valentine’s Day was a few days away, and I overheard the guys talking about the flowers, dinners and such they were planning for their significant others, and sometimes they even asked me what a woman might like, which made me feel appreciated and very sisterish. On Valentine’s Day, I approached the morning very low key and got busy with work immediately to distract myself, so I wouldn’t feel left out on “heart day.” Around noon one of the guys I worked with handed me a big card. I started blushing right away and (with red hair and an ivory face) it was very noticeable. The gesture was totally unexpected, so I was surprised, but I also felt relief wash over me when I took the card. I thought, how nice it was that he thought to give me a Valentine’s Day card. My giddiness nearly reverted to my eight-year-old self, when Ricky Wall gave me a purple, construction paper heart and a bag of butterscotch. When I opened the envelope, the picture on the card was very pretty; an arrangement of colorful flowers and on the heart in the center it said “Will You Be My . . . . . . . . , ” then I opened the card to read “Groundhog?” with a picture of a groundhog below the word. All the guys were standing around smiling, waiting for my reaction. I kept staring at the word groundhog and it felt like I had been standing there frozen in place for 10 minutes, when actually it was only a few seconds. My eyes started welling up, and I ran to the bathroom where I cried until my eyes swelled shut. I guess it was supposed to be a funny joke, but whether it was the stress of the job, the longing for a valentine of my own or maybe it was just that time of the month, I didn’t take it quite so funny. I put cold water on my face in an attempt to return my look to pre-humiliation, but red eyes and a puffy pink nose were evident when I returned to my desk, where dead silence hung heavy in the air and everybody, including me, looked like we needed rocks to crawl under. Then later that afternoon, the same guy, my supposed-to-be friend, walked up to my desk and placed a long white box in front of me. My body stiffened like setting concrete, wondering, what now, roadkill? He said, “Go ahead and open it, it’s safe.” When I lifted the lid, I found a dozen, bright and beautiful, red “mercy” roses, which caused me to cry again. He said he was “truly sorry about the card, it was only meant as a joke they really thought I would laugh over.” It was a very embarrassing Valentine’s Day for me. All I had hoped on that day was to not get noticed as ‘no one’s valentine,’ but my unexpected emotional reaction to their intended joke and the similar outburst during the follow-up apology effort are legendary and will hang in the hall of “My Worst (but only now funny) Valentines Days Ever.” Thanks readers, for letting me verbalize this and get it off my chest, as it has been a very heavy burden for many years. : ) Sounds very . . well almost, funny now – but it wasn’t so funny then. Now that I’m a wildlife rehabilitator and although I don’t work with groundhogs on the coast, maybe the question was meant as a compliment. Groundhogs are kinda cute! Photo credit goes to HogHaven.com. 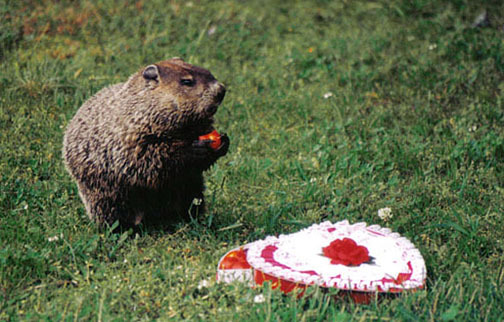 Visit them sometime to see how interesting, smart and cute groundhogs truly are, and that’s all I’ve ever wanted to be. There was a time when the notion of offering Character Education in our schools was opposed because so many people believed core ethical values, forming the foundation of an individual’s character, were developed in the home. I think we’re all leaning the same way on that now. We’ve realized the full responsibility and importance of developing good character can not be left to question. The school system has taken on a huge role in grooming the pillars of character; trustworthiness, respect, responsibility, fairness, caring and citizenship, but I’ve learned through personal experience that a single library book, filled with life lessons, has the opportunity to influence and live closer to an individual, no matter the age, locale, ethnicity, or economic status, than a structured learning environment. Of course, that’s assuming “Johnny or Bonnie can read,” which is another issue to be discussed at a later date. Don’t get me wrong. I thoroughly enjoyed school; secondary, college, as well as, post grad work, but I can honestly say I learned more about life and how to continually groom who I wanted to be and became through the independent books I’ve toted around and read than any class I ever attended. Although I never ran away to join the circus like Toby did, situations characters found themselves in, be it a fictional or a nonfiction write, were puzzles to solve. How the characters involved handled precarious situations were lessons learned whether I chose to adopt or dismiss their methods. Not all lessons are the “do’s” in life. Ralph Waldo Emerson had lots to say about character, but the statement that sticks with me and probably the one most remembered by others is “What lies behind us and what lies before us are small matter compared to what lies within us.” And what character lies within us is grown and developed by those we come to know in reality or fiction while experiencing our gift of life. I feel a huge responsibility toward my readership when developing characters because I recognize people change when they read. Although I have authored numerous articles, short stories and a novel, I have this need to ping back and forth, between writer and educator. I’ve often wondered if abandoning educator would make me a better writer, but I’m not sure it’s possible to stifle the teacher in me. The call to educate might be too great. Someone once wrote “Character is what you are in the dark.” I believe that too. Honesty should happen whether anyone is watching or not. Values that denote individuals of good character have been roughed up over the years, some even abandoned, so it seems people have to be encouraged to differentiate between what’s good and what’s bad. But writing has definitely changed; evolved in many ways and not always in the best direction in my opinion. On occasion, I read a book where the lead character champions less than honest, less than kind, less than respectful, less than good all around and can still be perceived as coming out on top, based on new and lacking standards. I find that troublesome because those who are teetering or easily influenced, especially a young mind whose character is still developing, may adopt the darker dispositions of life because they have been glorified or celebrated in a published work. When I build my characters, it becomes a requisite for me to leave the light on for everyone who picks up a Bergman-Althouse story. Is that wrong? Is it limiting? Or, is it responsible writing? Or does it even matter?